Life for the handicapper can be made so much more simpler. Today's horseplayer is likely to play more than one track a day. Speed handicapping is required in many instances, especially for the many who don't rely on computer print outs in order to determine their bets. We've seen tremendous improvements in the past performances that were available in the early 70's to today. Speed figures, pace figures, turf stats, workout ratings, trainer stats, jockey stats, etc. have all helped level the playing field. Still, there are many holes and unanswered questions in the vast array of past performances that are available to the consumer right now. These holes can be filled in by doing extra research: watching race videos and doing your own track bias ratings, and marking down wind speed daily. But I think these things should be covered by those who chart the races for a living, and they should be available in the past performances. If you want to have some fun, go search the internet for the official amount of feet in a length. You'll get answers anywhere from 7.5 to 10 feet. Horses range in size too. So when a tiny horse wins by his length, does he win by a length, or really 3 quarters of a length? The #2 horse has a 12 (subjective) length lead when he crosses the wire. The #3 horse was second when the #2 crossed the wire, but was tiring very quickly. The #5 horse who was 16 (subjective) lengths from the #2 when he crossed the wire first, wound up plodding along to finish second by 2 (subjective) lengths. Oh, and it was a muddy track, and the second horse finish the race exactly 4 seconds after the winner. How many lengths does the chart show the #2 won by? 12 lengths? 16 lengths? or 20 lengths? And what about the third finishing horse, did he lose by 14 lengths, 15 lengths or 22 lengths, or 23 lengths (as his final time wound up to by 4.60 seconds slower than the winner's time)? I wish I knew the answer. And I don't think anyone does definitively, and what may be true at one track, may not be true at another. Horses do go slower the farther they go, and then you have to factor in the speed of today's track and the wind speed as well when it comes to how fast a horse is going at the end of the race. When a horse loses by 10 lengths going 5 furlongs, does that mean he ran 2 seconds slower than the winner, the same as when a horse loses by 10 lengths going a mile and an eighth? Even though they are subjective lengths, it takes a lot longer for a horse to cover 10 lengths go further. And what if the horse is really tiring or coming on strong? I want to know the final time of every horse so I can determine the lengths lost myself, and since I'm a speed handicapper, it would be nice to know the exact times I'm dealing with. I can live with guesstimations when it comes to lengths beaten at every other call, but not the finish. This is a no brainer. The chart maker simply jots down the wind speed every race. And that wind speed should show up in the past performances. They somehow have the technology to do this for quarter horses, so I know it exists. This is important because when the wind gets up over 20 mph in a race, it definitely can create a bias. Horses with the wind at their back in the stretch have an advantage if they are closing and have more energy in reserve, while horses on the lead have an advantage if entering the stretch against a strong headwind. A simple notation like 25b or 25h means that it is either a backstretch wind or a homestretch wind of 25 mph. Steve Klein, in his book The Power Of Early Speed came up with a universal way to quickly come up with a relative speed bias number. It isn't rocket science. Without giving it totally away, it has to do with the first call positions of most winners on a daily card, and then averaging them out, giving certain weights depending on the starting position. I do think it can be done more effectively by incorporating the top two finishers and the favorite, but the principles will remain the same, and it could be calculated by a computer program in a nanosecond (or whatever the term is for almost no time). The number can be scaled to be out of 100, where the higher the number, the more likely a speed horse lasted. Wouldn't it be nice if one could look at the past performances and see that a horse was in the back of the field on a day that had a 72 speed bias rating? The same way a speed bias can be quickly be determined, a rail/outside bias can also be determined. Use the first two finishers and the favorite (if not in the first two finishers) and plot where they were most of the race. Anything 2.5 path or greater is consider outside, and anything less than 2.5 path is considered rail/inside. Again, an average base on the results of the day is made, and a number out of 100 is placed on the running line of each horse's past performances. A 22, for example, would mean a good outside, bad rail, while a 60 would mean a good rail, and a bad outside bias. The chart called needs to put down how wide each horse was at three different points of the race. For one turn races, average backstretch, average turn, and average stretch. For races over a mile, average first turn, average backstretch and average final turn. In a sprint 3R2 means that the horse was 3 wide on average down the backstretch or midpoint of the backstretch, on the rail most of the time on the far turn, and 2 wide either mid stretch or on average during the stretch. Checked or boxed in (like you see in harness racing) can be illustrated with a small c or b after the specific rating. Using my above example, if the horse was checked in the far turn, the line would read 3Rb2. This data can replace the comment on the horse's line if space is needed to be accommodated for. The harness racing folks are way ahead of the thoroughbred folks when it comes to showing the class and competition a horse could have run against if not scratched. Sure, many past performances available show some scratch info at the end of the card, but it means flipping back and forth, and the information of who the horse would have run against is only available if you dig up your old past performances, or you have a good memory, or happen to have a one-time good memory. Just like when a horse was previously trained by a someone gives the player something viable to consider, so would seeing a "vet scratch" line 3 weeks ago, with a bad workout following it, for example. Simply put the jockey's name in italics if he or she was not the named program rider. Again, the more info, the better for the bettor. Surely the good people at Equibase can get the show on the road, and make it so that the PERFECT PAST PERFORMANCES can at least be available. 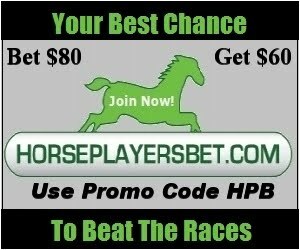 One more thing, if you are a bettor who wants a chance at more preferential treatment by the race tracks, please click here to join HANA, it will take you less than a minute, and it is completely free. We need the numbers to have more clout. I wound up going to the track on Tuesday after one of the members over at Pace Advantage sent me a message saying he was coming in from British Columbia. I normally like to play from home, but I'll make the odd exception every once in a while. Melanie Pinto is all smiles after guiding Love By Design to a romping victory in that fifth race. Remember, you can follow JockeyMel on Twitter. Let us not forget about Melanie Pinto's agent, former jockey Paul "The Squirrel" Souter. Souter also has the books of Chris Griffith and Sunny Singh. Here is a pic of Tim from Hastings and Billy Joel. Oh wait, that isn't Billy Joel. I know I snapped the picture of this romping winner of the 8th race, Miss Yankee at least a few yards before the wire, but I guess she was going too fast, as she won for California Stables and the meet's current leading trainer Daryl Ezra in 1:16:79. Not bad for a filly running for just $5,000 claiming. Fort Erie is a beautiful, but unfortunately there is a good chance that this could be its last year. The owner constantly wants too much for the place, and there is no more money left for Nordic to extort to keep it alive in 2010. The only chance I see Fort Erie sticking it out is if the OLG gives them a special rate on the slot winnings, or Woodbine Entertainment decides they really need Fort Erie to operate. Could David Willmot save the day? See also, Track Future Unclear by John Robbins. I know that many people just found this link by searching "Chantal Sutherland." I am being up front here, letting you know that I am exploiting this fact by also trying to talk you into joining the Horseplayers Association Of North America (HANA). If you are a horseplayer, I see no reason why you shouldn't join. OK, first, like I promised in my post title, here is a link to Chantal Sutherland's new web site. Thank me by coming back and joining HANA (I know you might not be back here for a half hour, but I'm patient). If you are already a member, tell your horseplayer friends to join. Send them the following link in an email: http://www.jcapper.com/HANA/SignUp/HANASignUpForm.asp?source=1 and you can add Chantal's site too if you wish: http://www.jockeychantalsutherland.com/ . You can also simply email this blog post. HANA is what it is. There are no secrets, no magic answers, or magic questions. Horse racing has tried to hoodwink its customers and treated them so poorly for at least three generations that the last thing any horseplayer organization should do is the same. If you want lower prices so horse racing can compete with other games, and bring new gamblers into the fold and grow the sport, you would be at home in HANA. If you are tired of seeing racetrack executives that have absolutely zero knowledge of gambling in charge of this game, and want to see new blood, or the old blood expelled from this control, you have a home at HANA. If you are tired of seeing old time deals, like the data deals which bend horseplayers over the barrel, making them pay thousands of dollars a year for the privilege of giving 25% of each dollar bet to play and support racing, you have a home at HANA. If you are tired of seeing "tote delay" on your screen because of 1978 technology and no one standing up to do anything about it, you have a home at HANA. If you are tired of seeing multiple rules violations being treated like a misdemeanor, while seeing treatment of said violations in innumerable ways by jurisdiction, you have a home at HANA. If you disagree with that stance on those issues, and similar ones, you would not feel at home at HANA. It really is as simple as that. We are not everything to everyone, and would never try to be. We are here for horseplayers, and here to help grow the game of racing, promoting a sea-change in thought, and a sea-change in the way this business has operated. The business has been run into the ground the last dozen years due to the intransigence and lack of expertise of its leadership, and it is time that it is stopped. In any other business they would be long gone by now, but in horse racing, they need to have that control pried out of their monopolistic fingers. You have absolutely no obligation to do anything after you join up. Your participation is valued, but absolutely not required. The board members do have a weekly conference call every Wednesday night, so if you have an issue you think we should look at, there are many ways to get in touch with us. And don't forget to tell your friends to join as well. Not sure if Queen's Plate was held on Father's Day last year. But the figures are still impressive in light of the fact that handle has been down around 8-9% almost everywhere in North America so far this year. Did horse racing finally hit bottom? The increase could be partly due to Woodbine's new agreement with TVG, but more probably is related to their new Turbo Charged Pick 6. Players who normally wouldn't handicap Woodbine yesterday may have made selections, and then were compelled to bet on the individual races besides betting the Pick 6. $140,000 was added to the pool yesterday in new money bet. But it was hit. Without the $150,000 Woodbine put in, they may have got $10-$20,000 into that pool because it was Queen's Plate day and there would have been a small carryover to begin with. Unfortunately for Woodbine, someone hit it yesterday so they will be putting in another $150,000 next Sunday to Turbo Charge the pool. So, assuming that this betting gimmick didn't get bettors to play other races (which is probably a bad assumption), on the surface, Woodbine lost around $120,000 so far. It is early though. Lets see what the future brings. Free past performances (thanks TrackMaster), pace figures (thanks pacefigures.com) and Thorograph for the 7th race at Monmouth is available by clicking here. We opted for a state bred conditioned route race with 11 horses. We would have gone with a grass race, but Mother Nature told us not to. Energy Crunch, out of post 11 looks like the horse to beat, but he has been off over 40 days. I'll probably be keying Max Hazard first and second in triactors and supers. Tough race, especially since the two fillies have much the best speed figures going into the race. Milwaukee Appeal, is the probable favourite. I successfully picked her in the Oaks, but I'm anticipating a bounce tomorrow, and I'm leaning towards the runner up in that race, Tasty Temptation (the other filly) to win the Plate. She made a huge move only to flatten out a bit in the stretch in the Oaks. I really like this angle when it comes to horses getting in shape and when they go further off these types of performances, they tend to do very well. Her jockey, Patrick Husbands owns Woodbine right now. You have to give consideration to Rapid Release because trainer Roger Attfield just knows how to win this race. This one is set up for a peak effort tomorrow. But his best effort may not be good enough to beat the girls. My long shot is Keino West. If the pace collapses, and in these type of races, it often does, he'll be coming to pick up the pieces. He reminds me of 1986 Plate winner Golden Choice, who was a maiden and won the race back then. Keino West is no maiden, but the way he prepped in the Plate Trial was very similar to the way Golden Choice prepped going into the big race. I'm not convinced on Eye Of The Leopard. I just think he fluked into the Trial win and he may bounce off that race, but then again, I thought last year's winner, Not Bourbon couldn't get the distance in. In other words, I'm wrong.........a lot. In what might be the biggest story in horse racing this year, Chantal Sutherland now has her own web site. Most of the site is a gallery of pictures ranging from racing pics to her Vogue spread. I'm debating whether to download the Chantal Screensaver. 'Beckon's agent, Tony Esposito, said the rider was still under heavy sedation but was breathing on his own after being taken off a respirator. Esposito added that a CAT scan scheduled for Thursday was canceled because of swelling in Beckon's brain caused by outer cranial bleeding. Fort Erie announced yesterday to their backstretch that they will try to fill 9 races instead of 8 on Mondays and Tuesdays. Lately they've been getting handle of around $800,000 for those days, and another race that happens around 5ish would most likely add another $150,000 to those totals. "One thing I do is to check out the track bias, and if one exists then I let the jockey know the preferable path to be on," he (Ezra) said. "Of course, the pattern of the race can restrict a rider from getting to the ideal path, but when the opportunity is there, it can make that little difference that can mean so much in the final result." TVG has signed an exclusive with Woodbine/Mohawk and are going to be promoting them heavily in the future. This is a horrendous precedent that will be bad for the game and bad for every horseplayer. While some people will say, so what, it doesn't matter. I don't bet there.....It matters a lot. It is a huge step backwards in trying to send a message that lower takeout matters and should be promoted. It takes more money out of circulation for ALL tracks now that more bettors will be exposed to these tracks for the first time and lose a % of their churn factor to the criminal takeout rates....etc. I think the public is more aware than ever, thanks to the efforts of HANA and blogs like mine when it comes to high takeout rates. Even with the new exposure, Woodbine only did $2.3 million yesterday in handle, even though they carded 10 races. The public is avoiding or treading lightly when it comes to betting on high takeout tracks. If you aren't a HANA member, please join up, it is free, and the bigger the numbers we have, the more clout we have. He doesn't think it will work. I do. At least, it will bring in some bigger handles for Sunday racing that will more than pay for Woodbine's cash influx, I believe as I stated in my previous post. I do want to see the Pick 6 pool to do well, because like Pull The Pocket, I want to see tracks succeed when trying new innovations that are pro-bettor. But I'm mixed about any additional action in other pools Woodbine will gain because of their ridiculously high takeouts on most of their exotics. From Paulick Report: What happens next. Penn National is convinced that the problems with United Totes are behind them. They now have reverted back to closing betting when the bell rings. In a huge move, Woodbine has decided to contribute $150,000 to their, now weekly, Pick 6 pools starting this Sunday. The Pick 6 pools have been a dismal failure up until now as it took a good 25 racing days for the pool to climb to $100,000. At Woodbine it is hard enough to grab a Pick 3 let alone a $2 Pick 6. Meanwhile, California tracks always gets huge pools, even if it is the first day of a carryover. This now makes Woodbine's Pick 6 one of the best bets in racing today as bettors are pretty much starting off with a positive takeout, until $600,000 is in the jackpot, as the takeout is 25% for this bet. On Queen's Plate day, this Sunday, we could see a pool of around $500,000, even more. It will be interesting. "70 percent of the pick six pool will be allocated to ticket holders with six winners, with the remaining 30 percent to be distributed in consolation payoffs." If someone hits the Pick 6, Woodbine will replenish the pool the following Sunday after it is hit until the end of this year. "Our purpose is to raise awareness of Woodbine, predominantly in the United States, where it's sometimes a struggle to get eyes on our product," said Steve Mitchell, CFO of WEG. Definitely, bet the Woodbine Pick 6, if you are so inclined, but keep your hands in your pockets or tread lightly if you bet triactors, supers, or Pick 3's. I forgot to report a couple of weeks ago that the consortium looking to buy Fort Erie race track waived the June 11th deadline. In other words, there was no way in hell that they were going to get $35 million guaranteed by the government for the purchase. Nordic gets to keep the $2.5 million they extorted from various parties to keep racing going this year at the Fort. The Consortium and the HBPA are now trying to come up with a viable solution to keep racing going for a long time. Noble as it may seem, they are really at square one, as they have to come up with dough to buy Nordic out. Whether it comes from one investor who buys the track, or a bunch of investors who buy bits and pieces, they need to most likely come up with a still unrealistic sum of money that Nordic will accept. The $35 million was a joke, and with the Magna tracks coming onto the market soon, there are only so many buyers willing to buy a racetrack, so the demand for Fort Erie is definitely not great, especially when dealing with Nordic, who historically have overvalued the track by huge sums. I think the governments participation as guarantor will depend on a couple of things. The price, and how close Fort Erie's bottom line is to break even. And it would have to be very close to break even if the government is to back them. Again, the only real solution is to give Fort Erie a bigger cut of the revenues from slots, something the OLG doesn't seem to want to entertain. Speaking of the OLG, they finally awarded the jackpot money to the person who thought he won 2 $1 million jackpots. He got what he was supposed to had there not been a "glitch": $5000. 'Agent Tony Esposito said Beckon was alert immediately following the spill but began drifting in and out of consciousness before being admitted to Sunnybrook's critical care unit. He was to receive a CT scan this morning. Beckon has two broken vertebrae, a broken nose and cheekbone and "some outer cranial bleeding," Esposito said. Effective Wednesday, June 17, Woodbine Entertainment Group will reduce the takeout on its live thoroughbred and standardbred triactors to a total takeout of 27%, from 28.3%, when all of the mandatory regulatory deductions are included. Though it is encourage to see that a takeout rate has been reduced in North America, lets not get too excited. With this drop, Woodbine now has gone from having the 68th highest triactor track takeout to now being tied for 66th (out of 71 tracks). They "zoomed" by Fort Erie (28.2%) thanks to this drop. Unlike U.S. racetracks where taxes are primarily applied to winnings, Canada has its taxes applied as a percentage of wagering. More specifically, mandated regulatory deductions account for 6.8% of wagering or about 24% of Woodbine Entertainment Group's (WEG) total triactor takeouts, the majority of which is represented by the province's 4% Horse Improvement Program. That is not the consumer's problem. From a customer's standpoint, this is still no justification to have the 66th highest takeout. There are 56 tracks with takeouts of 25% or less, and they all make less than Woodbine does right now when taxes are taken out. And it isn't like the H.I.P. program doesn't help Woodbine's business by making it more lucrative to own a horse running at Woodbine and helping the field size as well because of the purse structure. Bigger fields equals more betting. WEG's efforts to make its live race triactors more competitive by replacing this excessive pari-mutuel levy with a slots-based levy have been rejected by horsepeople's associations. Nobody said the horsepeople's associations understand growth. But again, it is up to Woodbine to explain the situation better to them (they have failed obviously). But it is still good to know that the HPBA are a bunch of collective self serving fools. I knew that already. Simultaneously, in order to partially offset $1 million of new simulcast costs demanded by some Churchill and Magna controlled tracks, triactor takeout rates on these simulcast signals will increase to the same 27% total takeout including all mandatory deductions. Tracknet has increased signal fees. This hurts the bettor in a big way. Woodbine too, charges a high signal fee, so they aren't innocent here either. And upping the takeout rate to 27% by Woodbine should be deemed illegal. Canadian customers will be getting ripped off even more by WEG if they play Magna or Tracknet tracks. For example, if a triactor pays $810 at Churchill at Churchill, those playing through American ADW's and at Churchill, as well as at simulcast locations will get $810. If someone takes the same risk and cashes the triactor on HPI or Woodbine controlled tracks, the payoff will be $730. This means that nobody should be betting these tracks through HPI. There are alternatives. And players must use these alternatives. The tracks affected are Arlington Park, California thoroughbred tracks, Churchill Downs, Fair Grounds, Gulfstream Park, Oaklawn Park and Pimlico Racecourse. California regulations also mandate an additional 0.5% on their tri pools. Again, if you place a bet on these tracks through HPI or at a track under Woodbine's umbrella, you are a mooch. WEG understands the sensitivity of price increases but believes that limiting the increase to only tri pools on a small number of tracks is better than the alternative of Churchill and Magna pulling their simulcast signals from the Canadian market. Translation: WEG relies on players being suckers and mooches. As a net result of all these changes, WEG will still absorb approximately 90% of these increased costs or $900,000 per year, in an effort to minimize the impact to its customers. The recent simulcast agreement with Churchill and Magna will ensure their signals remain in Canada at least until the spring of 2011. I won't be betting Tracknet or Magna tracks though WEG, so it really doesn't matter to me. It is hard enough to try to beat this game without getting ripped off because a company (WEG) puts itself way ahead of the customer. If WEG cannot afford to pay out the exact amount that a triactor pays, they should not offer the product, and the government should take steps to not allow them to get away with upping the takeout rate to suit their bottom line. We are encourage players to put some money in the 9th Race at Monmouth tomorrow. The race is the Monmouth Stakes. Free past performances for the race, thanks to TrackMaster and PaceFigures.com. Strike A Deal might have the fitness edge, but since he is 0 for four at the mile and an eighth distance (with two seconds and a third), he looks like one to include in the exotics, but hard to key on in the first position. While some things have improved, others haven't. The sky-high takeout rates that are in place at all Pennsylvania tracks remain in place. Takeout is the set percentage of money taken from a betting pool and not redistributed in winning payoffs. ..............Horseplayer and former economist Maury Wolff has estimated that for every one percentage point increase in takeout, handle decreases between 7 percent and 8 percent. For six consecutive years, Tampa Bay Downs has decreased takeout levels at the start of their meet, and it's no surprise that their racing product has enjoyed a rapid increase in popularity over that time frame. ...............Presque Isle Downs has developed a reputation as a track that cares about its own slots players and cares about keeping the horsemen content, but does not care about the horse player. Presque Isle, Woodbine, Fort Erie, the list is pretty big when it comes to that last line. A couple of things happened in the last week which don't put me quite into sage status, but it does show that my ideas to improve horse racing are not only feasible but workable as well. Lets start with the first item. A member of Pace Advantage Forums who works at Prairie Meadows has been openly soliciting ideas from HANA members. Whether Prairie Meadows does anything with the ideas is another question. I don't get the variable takeout scenario. The more horses in a race, the more is bet, however less players cash because of the degree of difficulty. So less money is churned immediately. In small fields, less money is bet, but more people cash. And more people will churn back the money won back immediately. If I ran a track, I would have a base purse for different classes (which are lower than the average), and I would add X amount for each individual starter over 6 horses. For example, at Fort Erie where they run for around 9,000 for a 4,000 claimer, I would set the base purse at say 7,500, and I would add 500 for every parimutuel entry that starts the race over 6 horses. So a 7 horse field would have an 8000 purse, and a 10 horse race would have a 9500 purse. That is the way it should be everywhere. Averages need to be adjusted so that the total purse money available is distributed to the horsemen for the season. Three days later, Charles Town announced that they would "offer purse incentives in certain races with seven or more starters effective June 6 in an effort to increase field size." Did the execs read my comments and act on them? I don't know. I do know that racing execs read this blog (lots of hits on my blog comes from Woodbine, for example). The Pace Advantage Forum is the number one horse racing forum on the internet (it attracts the most sophisticated bettors and horsemen), so I have to believe that execs from a multitude of tracks read what is posted there, and most likely, many are forum members as well. Regardless, of whether Charles Town "stole" my idea, the fact is that my idea was workable and credible. Now lets look at example number two. After the past posting incidences at Hollywood and Penn National, I started a thread on Pace Advantage about closing the windows at 1 MTP. I even wrote a post on Cangamble about it as well. At least two thirds of those polled are with me. Close the windows early. Some people suggested right at zero minutes to post, and a few suggested to close the windows when the first horse loads. Effective immediately and until further notice Penn National Race Course will close wagering on all live races as soon as the first horse enters the starting gate. This move won't help Penn National, who have one of the most brutal track takeouts in North America. Sophisticated bettors (those who also care about integrity), stay clear of the track anyway because of the takeout. And batch bettors (who usually bet with big rebates) will not adjust their system for just one track, so this too will hurt Penn's handle. Many bettors will be turned off by this because they don't have this situation at all other tracks yet. The bulk of betting money comes in late, and until the majority of tracks do the right thing (what Penn is doing), Penn's effort here is fruitless, but I still commend them, and hope the majority of track's follow in their foot steps. I like Milwaukee Appeal today to win the race, though I think it is a shame that Scott Fairlie had to import a jockey for the race. If Double Malt gets a decent pace to run at, watch out, she should get a good a piece. A Good Claim At Woodbine Today? I have been offering my advice to a few individuals over the years when it comes to claiming horses at Woodbine and Fort Erie. I'm right a lot, and I'm also wrong sometimes. Today in the fifth at Woodbine, there is a horse who definitely looks like she a worth taking. I want to also mention that I wouldn't be writing this post if any of my connections were getting a claim slip ready. She Runs On A Diesel. $20,000 race 5 Woodbine. First race was an above average speed figure (for 20,000 maiden fillies) against a slight speed bias. The time of the race was good for the day. Galloped out great. Watch the replay at HPI May 15th race 9 or look her up by name at Cal Racing. She was last after around half a furlong, so she is easy to find. Going two turn after a five furlong debut. This means she should be physically OK at least, and because she is radically changing distances, she may come up short and save the condition which means more potential money for a new owner. There are at least four horses who can get the distance in, and beat her just on conditioning today. Workout pattern doesn't show any breaks before her first race and workouts have been slightly above average. A 3 year old filly that can go long is the best type of horse to own for upside. Ontario sired maiden and nw2 run for $62,000+ purses. Trainer is high percentage this year (though he usually is an average trainer). Why is she running so low after the first race? Owner may just want to win. Does the owner know her breeding on the dam side? Dam only threw one other horse (she looks to have a problem foaling) who was unraced, but produced a winner. Is she worth $20,000 as a dam prospect? There may be a shake for her. If more than a couple of people see the same things, these type of obvious claims usually wind up to be losing propositions. Sire is nondescript, but then again most Ontario sires are. The money is great if she improves even in the slightest. If I was independently wealthy, I certainly would take a shot on her. Of course, the trainer would have to give her a good look before dropping the slip (no interest in the breeding game right now). If she has the looks of a bad knee or a bow, etc., rip the slip up, they'll be others to claim. Lots of horses who are being asked to go a mile and a half without racing for at least 5 weeks. I don't like that angle. This fact makes the race Mine That Bird's to lose. If he shows up, he wins. Very simple. I like him with Preakness surprise horse Flying Private to coast into second. And I'll stick to Preakness graduates for the triactor and throw in long shot Luv Gov. Ajax Downs opens up tomorrow. They have revamped their web site. If you decide to check out the site, cover your ears. Lots of updates at the Ontario HBPA site. -Lite Touch Whip Pilot Program has begun. First two races each day Woodbine, all jockeys are to carry the new fly swatter type whips until June 28th. -Fort Erie to move post times to 1:45 effective this Sunday. -testing for the following veterinary approved anabolic steroids: boldenone, nandrolone, stanozolol and testosterone has begun as of June 1st. -Owners and trainers have the option to test claimed horses for steroids. The price is steep at $225, and the request has to be made when the claim is put in. I wonder if the majority of horsemen who put in a claim will request the test. They risk their licenses if the new claimed horse tests positive for steroids in upcoming races. Generally, steroids remain in a horse's system for 45-60 days. One other thing that wasn't made clear: What if the horse winds up to be one of the two horse's tested after the race? Does the new outfit still have to pay the $225 if they requested the steroid test? Are the two tested horses going to automatically be tested for steroids all the time? How many trainers are there who were over relying on steroids in the past, and now know will have to figure out an alternative way to train horses? Personally, I don't think there is any reputable gambling site that comes close to allowing minors to play. I didn't know about most of these, including Dora Ratjen, who was a high jumper for Germany in the infamous 1936 Olympics. Turns out that Dora's real name was Hermann, and Hermann still couldn't beat the girls (he finished fourth). Reade Baker's below average year continues (he now has just average stats after having a fairly good start in 2009). Last night, 6-5 favourite Bear Onamission broke down just before the wire in the last race. For some reason, on Baker's web site, his 2009 reports including race results aren't showing up. And what is going on with Mike Doyle? 2 for 50 so far at Woodbine. Congrats to Jody Hammett who is on the comeback trail. His only starter for 2009, Blue Blood Wildcat, won convincingly yesterday in an Ontario sired filly race last night. I'm sure co owner Charlie Buscaglia was made happy for at least a couple of hours. Beyer pretty much concedes that Polytrack and speed figures is parallel to turf and speed figures. They are nowhere near as reliable as they are on the dirt. 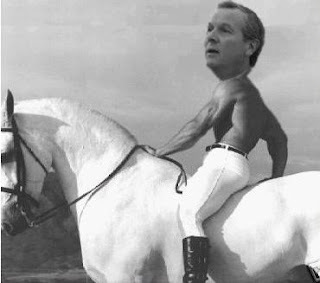 Opinion: Internet Gambling Bill in the US would help horse racing if it is passed because it would allow horse racing sites to include poker, etc. This is a great way to attract young gamblers and keep their money on shore as well. Thoroughbred Owners Of California bid on Santa Anita They are rightfully worried about keeping horse racing alive in their state.